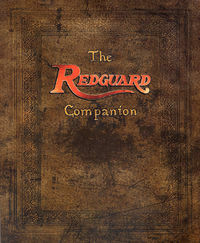 The Redguard Companion is the official hint and strategy guide for TESA: Redguard. It provides a complete walkthrough of the game, descriptions of each character and enemy you may encounter, and labeled illustrations of the places you'll visit. "The Redguard Companion is intended as a comprehensive guide to the game world of Redguard, Whether you need an occasional hint to help you solve the toughest puzzles, a step-by-step guide to solving the game, or something in between, you will find you answers here." The guide has a few names and other bits of lore that are never mentioned in the game. Arkay Fertility Statue — A name for the statue southwest of town, which actually depicts Morwha. It is said that "Arkay's Fertility Statue heals weary travelers in southern Stros M'kai." Brazier of Swords — The brazier revealed by the Talisman of Hunding in the Goblin Caverns. Catacombs — The names Hall of Warriors and Coliseum of Revolution as used on the Recover the Soul Gem walkthrough. Constellations — The Atronach is instead called the Golem and Dwarven variants are given for the Mechanist's (Mage's) charges: the Automaton (Apprentice), the Warmachine (Atronach/Golem), and the Laboratory (Ritual). Hallin Falls — The waterfall that hides the entrance to the Goblin Caverns. Kynareth — The shrines around the island are called Shrines of Kynareth. The description for canah feathers states that "These feathers from the exotic bird of Summerset Isle are both beautiful and highly useful, for the goddess Kynareth's light shines bright for them." The page about The Shrine of Kynareth also says, "Many sailors worship Kynareth, goddess of the air, and pray to her to bless their journeys with strong winds and true lines." Necropolis — The large stone structure on the Isle of N'Gasta where you find a crow bar. N'falilaargus — This spelling is used consistently for Nafaalilargus. Potions — Acute Healing is another name for Pure Water and Aloe Mix, and Blood Lust is the name for the combination of Orc's blood and pig's sac. Races — J'ffer is confirmed to be a Ja-Khajiit like S'rathra. Additionally, Urik is confirmed to be a Nord. "This small town on the southeastern section of Stros M'kai used to be an oft used dock for sailors in a hurry, not wanting to use the once busy docks of the main city. The port has now been reduced to a ghost town, and shelter for wandering pirates." Skeletons — They are the undead soldiers from the Battle of Hunding Bay. Town Plaza — Plaza of the Three Princes is the name for the town plaza. The pool is called the Regent's Pool and the structure above it is the Monument of the Three Princes. Vermai — It is revealed that the helmets that N'Gasta's vermai wear keep them under control: "Dark minions of the lesser Daedra lords, N'gasta keeps these creatures under his control through pacifying helmets." This page was last modified on 22 November 2018, at 22:03.